Ever wanted to have your computer have a Three Investigators flair? Well, now you can. I worked on this project for a few days, and I hope you'll like it. The desktop theme below contains a wallpaper, animated cursors, desktop icons, and sound events that are appropriate for fans of the Three Investigators series. I am hoping to add a screensaver in the near future as well, but that is not part of the current package. To install the theme, follow these instructions. 1. Download the compressed file to your local hard drive. 2. Locate the folder on your hard drive where the regular Windows themes are stored. It will usually be in a folder under the \Plus! folder. For users of Win98SE, it is in c:\Program Files\Plus!\Themes. For other versions of Windows, it may be elsewhere. 3. Uncompress the files to the folder on your hard drive where themes are stored. 4. 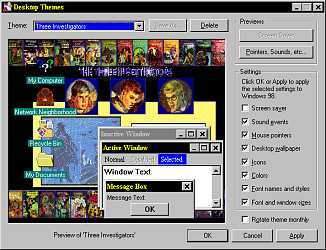 Go to Windows Control Panel, select "Desktop Themes" and then select the theme that is labeled "Three Investigators." Click on the image below or the title beneath it to download the Three Investigators Theme.